I am bummed to only be giving this book 3 stars. 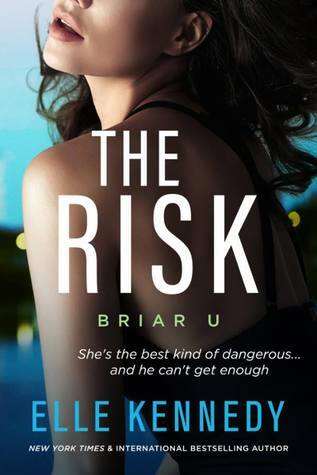 While I was reading the first book in Elle Kennedy's spinoff series, I was just dying to read Brenna and Jake's book. So, I eagerly awaited the release of The Risk. While I enjoyed the book overall, it wasn't exactly the hit that I was hoping for. It's hard for me to describe why this one didn't work as well as I thought it would for me because there wasn't anything inherently wrong with the book. In fact, Kennedy's writing remains top-notch, and she writes characters who are engaging enough that I was able to finish the book. I hyped this book up a lot for myself and I kept craving more intensity from these characters. I liked both Brenna and Jake individually. Brenna, especially, was a great girl with a good head on her shoulders. Her storyline was interesting enough, especially with her trying to get an internship at a company with a sexist prick of a boss. She was very passionate about hockey and was willing to suffer through almost anything to achieve her dreams. Brenna's storyline with her father was also one I really liked. I almost shed a tear or two when it came to them. Jake was a bit harder to warm up to because I couldn't quite get a strong feel for his character. I don't think I enjoyed him as much as I thought I would, but he was decent enough. The guy was equally passionate about his game of hockey and he was a good teammate. From the vibes that these two gave in The Chase, I was sure that this book would have some strong and epic hate-to-love/forbidden-love vibes. Then the actual summary of the book promised fake-dating. Those are all tropes that I am especially obsessed with. However, I didn't think The Risk did a good job with these tropes. In fact, all those vibes actually went away fairly quickly. This brings me to why this book wasn't exactly what I expected. I wanted so much more from this romance. I felt like it was very muted if that makes any sense. Brenna and Jake had so much potential, but their relationship didn't live up to it for me. I wanted more intensity, more chemistry, more sexiness. I just wanted more. I also found myself being very frustrated with some of the side characters' stories, especially Hollis and Rupi's one. It was so over the top and irritating. I just felt out of place in this book. Anyways, I'm sad that The Risk didn't live up to my expectations, but I'm certainly in the minority. I hope those of you who read it end up loving it! What are some books you hyped up too much for yourself?